Newcomers and visitors to the Minneapolis/St. Paul metro area are told repeatedly how bad the winter is. It's bad, yes, but with the right supplies, a good attitude, and the adoption of a measure of Scandinavian hardiness, the winter can be not just tolerable, but even fun. If you are coming from somewhere warm like California or Florida, it will likely take some getting used to. The winter is long and cold, snowy and icy, with blizzards and biting winds direct from the North Pole. How Long Does Winter Last? Sometime around late October or early November, the temperature plummets from mild or cool fall days to below freezing, and we'll get our first snowfall. Then, things won't change much until next year. Expect winter to end somewhere between late March and April. By April, the days should be mostly above freezing and much if not all of the snow will have melted. Minneapolis/St. Paul is the coldest metropolitan area in the continental United States. And that takes into account our warm summers. So, if you guessed that the winter is ​very cold, you'd be correct. The average winter temperature is around 10F. The warmest winter days are around 30F. Brrr, you say? By the time we get to February, a 30F day will feel very warm! January and February are the coldest months. Temperatures around or below 0F are fairly common in these months. It's unusual for the temperature to get much below -15F in the metro area, but colder temperatures are possible. Newcomers to Minnesota expect the cold, but they may not be expecting the windchill factor. The wind in Minnesota often seems to blow in directly from the North Pole. When the wind is blowing, it can turn an otherwise bearable day into an unbearably cold one. If there are high winds on a cold day, the windchill factor can make the temperature 20F colder. Expect to see some days with windchill temperatures of around -30F. How Much Does It Snow? 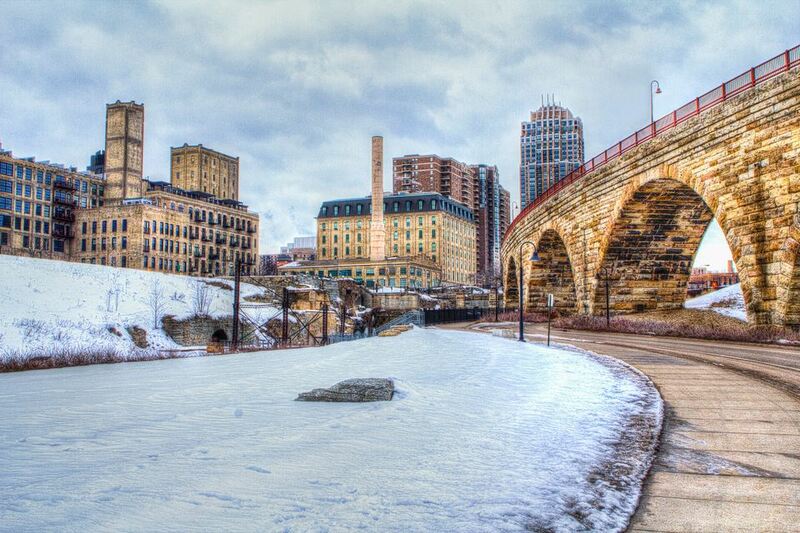 Winter snowfall in Minneapolis and St. Paul averages around 60-70 inches annually. Blizzards and snowstorms can bring in 3-10 inches of snow in a day or two. Skiers and snowboarders get excited about fresh powder. Others grumble about having to shovel snow and about other people who can't drive in the snow. Often after a blizzard, a beautiful crystal-clear day with brilliant blue skies will dawn, and it will feel almost warm. It's probably actually 25 degrees, but these days are perfect for getting outdoors for the housebound/office-bound at last. The snow that falls stays there since it's almost always too cold to melt. Snow is everywhere that's not plowed or shoveled. The plows leave snow banks by the side of the road, which turn gray with road dirt. Near the end of winter, as the mercury ventures above freezing, the snow melts partially into puddles during the day, then freezes into ice overnight. Watch your step. Are we there yet? The worst thing about winter isn't the cold, it's the length. Spring is frustratingly slow to arrive when we've waited this long for warmer weather. Signs of spring start in March, and it's exciting to see the horrible gray slush melt and by the end of the month, tiny green shoots poke up through the ground. You might spot buds on the trees. Spring has very varied weather. April can have days warm enough for short sleeves and ice cream and days cold enough for fresh snow to fall. Just when you think winter's over and the weather is warming up, the temperature dips again. And then rises...and dips...and rises... But by the end of April, winter has lost its grip, the days are getting warmer, and summer is on the way. Get your winter wardrobe in order, your car ready for winter driving, and your house prepared for winter in advance. Surviving winter is all about preparation. Learn how to drive in the winter. If it isn't essential to drive in a snowstorm, then don't. And if you are driving on an unplowed street, slow way down. Also, know snow parking regulations for any city where you'll be parking your car or risk getting towed. Check the weather forecast regularly. Snowstorms can be accurately predicted some days in advance and look out for blizzard warnings and wind chill warnings. Go ice skating at one of the free ice rinks in downtown St. Paul and downtown Minneapolis. Especially nice in the evenings, surrounded by twinkly city lights and followed by hot chocolate with Baileys or your liqueur of choice in it. Check out cross-country skiing as some of the best trails in the country are right in the Minneapolis/St. Paul metro area. Try downhill skiing and snowboarding at one of several hills within an hour of the metro area, or at a proper ski resort, Spirit Mountain, three hours north. Children love to play in the snow. Take kids sledding, or out to build snowmen, followed by hot chocolate. What's Christmas without snow? Going into a snow-covered field, choosing and cutting a Christmas tree, then warming up with hot apple cider and freshly baked cookies before heading home is a family tradition for many Minnesotan families. There are many days when it's a joy to be outside. The day after a blizzard is usually calm and clear - wrap up and crunch through the pure fresh snow. Winter celebrations like the Holidazzle Parade, the Winter Carnival, the U.S. Pond Hockey Championships at Lake Nokomis, and the City of Lakes Loppet are all must-attend events in the Twin Cities. Here's a list of more fun things to do in the winter.